Also included is a new storage tray solution that fits the tokens of all existing Small World expansions (even the Necromancer Island!) in a single, easy to sort, easy to access, container. An Awesome Expansion that adds some very nice races and abilities. Five new races and five new banners - a bit more expensive than the Grand Dammes or Cursed! expansions, but a few well-spent dollars (in my mind) go towards a new sorting tray that solves the problem of where to put all those races! You can ask Tom Vasel about that.... The races themselves are fun and balanced; this is a great expansion! A fun expansion that adds more desirable new races and abilities, along with a sorting tray if you've collected other Small World race/power expansions. The tray is improved over the base game's in that the race tokens don't get stuck in the wells. Unfortunately trays like this can crack and this expansion doesn't really come in a small box like I expected, but just a sliding carboard sleeve, that no longer fits snugly around the new tray once you've removed all the cardboard sprues. Therefore it is not as protected as I'd like. And neither this "box" nor the base game box has enough extra room to hold the Tales and Legends event card deck if you've collected that expansion, too. This also has room to house the Necromancer expansion, though it is not included here. 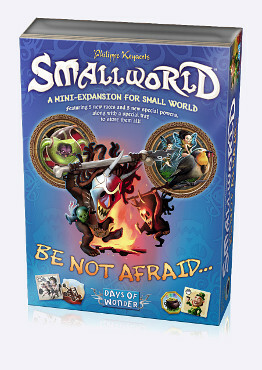 This new expansion features some interesting and very fun new races, your sure to enjoy it in your Small World games! This expansion is bigger than the two previous ones (Cursed and Grand Dames), and it adds a lot of new races to the game. This is great for added variety and it will certainly keep the game fresh for a long time. In addition, you also get a very convenient storage box for the races, which will fit all of the expansions released before this one.